You are always transmitting something when you play, whether you think you are or not. You have to decide what you want to transmit: yourself or the music. And she is only four years old. After many years of teaching, I never cease to be amazed at what you can expect from children – even the youngest ones. While this little girl is certainly very bright, I cannot say that she is musically precocious. She just needed to be told what music is all about in terms she could understand. A child is always expressing himself from the very first time he puts the bow on the string. He is expressing himself within the limits of his technique and his awareness of what music is all about. These are both things a teacher can do something about from the beginning. I wish I had a dollar for every colleague or recital observer who made the following comment: “Your students are so musical!! !” My answer to them is that it’s because my students have control of their bow arms and that they are, as a rule, not more or less talented than any other child. You can’t be expressive without technique. You also, in my opinion, cannot separate musical technique from instrumental technique. Okay, I admit it – I’m a stickler for bow control. I use the Suzuki method, which also means my students have listened to a lot of music, but by the third Minuet in Book 1 my students are pulling whole bows with wrist movement and thumbs in the right place on the stick – even the little ones. Why? Because they are happier if they can express themselves. If they like what they hear, they are inclined to play more, practice better and be, you guessed it, more expressive. Funny that the more I teach, the fussier I get, the better the results. We may not go quickly through the first two books, but I compensate with group lessons, Christmas carols, canons, orchestra participation, etc., where I don’t make too big a deal out of technique (with the beginners) so they don’t get bored or discouraged. Also in the group lessons the little ones hear the expressive advanced ones and thus are constantly reminded of the value of the technique I am constantly flogging. I do not have a law in my studio about how fast a student must progress. The beauty of individual lessons is that you can tailor your teaching to the needs and capabilities of each of your students. They don’t mind going slowly as long as they are going well. 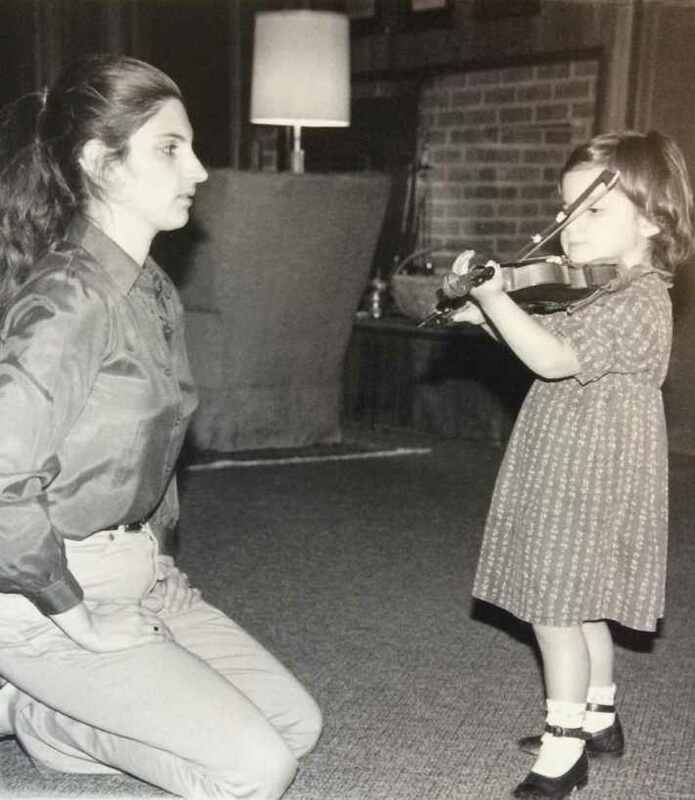 One of the advantages of starting children on the violin when they are little is that they don’t expect to play Paganini tomorrow – they are happy with a little bit of success at a time. This makes it easier for me to insist on technical issues (without being overly rigid). I have also used exactly the same method on adults and have had most of them get through Book 4 in as many years without much trouble. You may say, that this is all obvious. Don’t be so sure. I have seen LOTS of teaching where proper bow control isn’t taught for a long time, good movement at the frog is ignored and the baby bow hold is perpetuated well into Book 2, no matter the student’s age, with the corresponding results – or lack of them. However, the question is how to get students to play expressively from the start. Without the following, all the technique in the world can be useless – a good bow arm doesn’t exist in a vacuum. What is expressive playing? The question would better be, what is good expressive playing? Babies are already expert at expressing emotions. New parents quickly learn whether their baby is angry, tired, happy, etc. The emotions get more complex (love, jealousy, etc.) as the child grows into toddlerhood, but he is still expressing them pretty voluntarily. Then comes society, upbringing, family and his own personality into play and our baby spends the rest of his life learning to control his emotions. Rightly so – we can’t have people spilling out any emotion that crosses their horizon. We have to pick and choose the emotions we wish to express and then express them in a socially acceptable way. This is what music teachers are teaching their students: how to direct emotions in such a way to play expressively. And by that I mean the kind of expression that people want to hear, i.e., good musical manners which enable you to get your point across. You may not think your four year old student is expressive when he whacks the bow on his violin, but he is. The first thing to do is to realize that your students are already playing expressively. You may not like what they do, but it is an expression. Then you have to get them to realize what they are expressing. Most people, including my four year old student above, don’t realize that when they play they are expressing something – either about themselves or about the music. You can show a student how to pull a bow until you are blue in the face, but it won’t do any good unless she knows why she has to do it that way. Telling a child, “do it this way – it’s better,” just won’t do. Either you tell her why it’s better or you get her to tell you (I often use the latter approach and help the child find the words). In other words, what is music? What are we trying to do when we play it? What are our listeners getting from us? This means you are going to have to talk to your students. A lot – from almost the very first lesson. You might think that these are complicated discussions to have with the small students, but it isn’t so difficult. Children understand incredibly complex ideas, even if only on an intuitive level. Remember, you are not teaching a four year old – you are teaching a human being who has all the complex emotions and soul of a grown-up. Beginners need to be told that Music Is Important and we have to be careful about the sound we make as we never know where those sound waves are going to wind up. That we are putting vibrations into the universe. In fact, we are not playing for ourselves at all but for the universe in general. So this is how I do it. Give a child the best possible technique for his level (insist on it) and explain the basic tenets of music in terms that the child can understand and you will get, sooner rather than later, a socialized and musically correctly expressive student. Kids love it when you explain complicated and spiritual things – it makes them feel big and that they are doing something important, a feeling most children never get to experience. You are making them aware of the responsibility and great privilege of creating beauty which is a service to all of us. Some will do it better than others, some will be more expressive than others, some will acquire more technique than others and thus have more possibilities, but a basic awareness of what music is and its importance to the human condition will facilitate both expression and the acquisition of the technique necessary to achieve it. A good bow arm doesn’t exist in a vacuum…….. Loved this post. People underestimate children. The cognition and emotional expressiveness is there – it’s the communication that is not yet at adult level. Music is part of communication. Well said! And thanks for your kind comment! I loved this article and will use your ideas in my studio. Do you have any particular exercises for bow control with the young ones? Thank you!